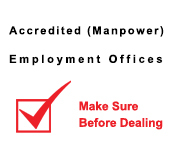 This portal offers services to the employer, the owner of the business establishment. All information and procedures needed to complete the transactions with LMRA are provided here. This portal offers services to the expatriate employee in the Kingdom of Bahrain. Expatriate employee will be able to access all the relevant information and procedures at LMRA. This portal offers a number of services to all visitors to the LMRA website. LMRA provides all the official statistics, as well as all laws and resolutions pertaining to the labor market in the Kingdom of Bahrain. In order to check the work permit validity, please insert in the field below the work permit number which is located in the upper part of the work permit. Expatriate employees can check applications submitted to LMRA to issue work permit, every application has a unique number. Employers and expatriate employees may now book an appointment for quick services provided by the Labour Market Regulatory Authority. Save your valuable time.